and going surfing on the weekend. for when you are enjoying nature in your leisure time. 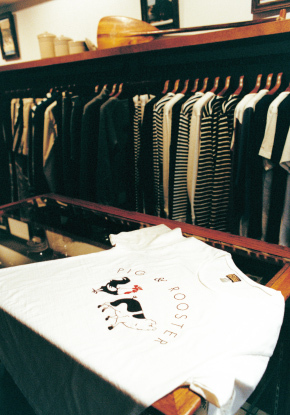 Based in Japan, Hawaii, and California, Pig and Rooster offers clothing with a taste of these cultures. Some people tend to focus less on casual wear when compared to formal wear. However, we believe casual wear should be considered in the same way, focusing on quality, detail, style and materials used. Casual wear can provide the most comfort for you; therefore our main focus is to provide the perfect fit of comfort and style. Our casual wear holds a premium level of comfort. The symbolism of Pig and Rooster holds a strong tradition amongst sailors in the American Navy. It is believed that the “pig and rooster” are the guardian angels of the ocean. Since then, this symbol has been cherished by many men of the water. Our good friend and artist Yusuke Hanai has designed our main logo, clothing tags and size labels. Through his distinct style and artistic vision, our clothing offers consumers a special mix of style, vibrancy and comfort. His flair for style has influenced our clothing to be able to be worn for many different occasions. Whether it is relaxing at home or cruising around the neighbourhood. As you enjoy the harmonized balance of your life with nature, we hope you also enjoy our clothing. In order to create clothing with supreme quality, we pursue all aspects of manufacturing to the finest details. 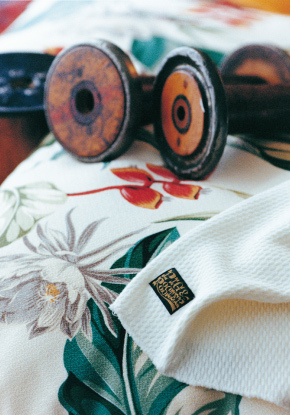 For example, we use organic cotton in our clothing and other choice materials from Imabari, Japan. We custom make our t-shirts, strengthening style and shape with every thread. We strive to find the best production houses for all of our products and it is with great certainty we can say our clothing is comprised of skilled craftsmanship. Our company intertwines the intricate delicacy of Japanese craftsmanship and the sheer toughness of American construction into a single blend of clothing. And the result of this is a supreme product, with hints of classic 50’s and 60’s surf culture as well as modern clothing design. It is just the right combination of all of the above that makes our brand Pig and Rooster so unique. The team at Pig and Rooster love the motto “Surf and Relax”. The meaning behind this motto is that in some parts of the world, part of a relaxed lifestyle is to be dressed in fashionable surf clothing no matter what the occasion. We want our customers in Japan to have the opportunity to also live this motto, so they will be able to wear clothing that reflects this belief. We hope to stretch people’s views of how casual clothing can be incorporated into everyday city life. Whether in the city working or at the beach surfing, we want people to be stylish and comfortable in the latest offerings from Pig and Rooster. PIG & ROOSTER crew’s motto is “Surf and Relax”. It is one of our biggest inspirations to our creativity, but different place have different perspective for it.For example, in Hawaii and California, people are going to surf, shop, and then heading up to work straight.In those cultures, they don’t really need to change clothes to finish one big routine of the day. We believe this is how life style should be. It is causal, but fashion in the town stay together with their lifestyle. However it’s different in Japan. There could be people who feel the need to change clothes to fit into different situations and styles. For example, they wear little too casual when they go to surfing to fit into surf style. However, when they go to city, they dressed up and have neater style to fit into city style. 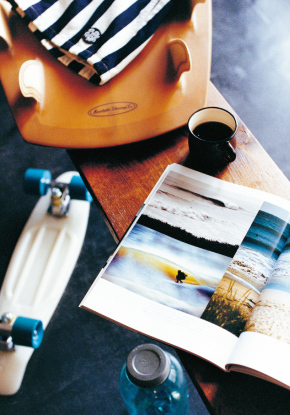 We believe life style would be better if surf life infiltrate more into city life. Therefore, PIG & ROOSTER try not to categorize different situations and try to provide the style that fits into the different situations such as going to surf in the morning and heading up to work straight, spending free time at home, or cruising around the neighbor etc. Just wearing simple T-shirt could be stylish. We believe that it could be done with having fulfilled lifestyle. We would like to create stylish medium that could create the style come up with fulfilled lifestyle harmonized with the nature.